Three people from Germany joined the ANWB Golf Pitch Open 2018 on 26 May at GC Holthuizen south-west of Groningen, one of the European cities with the highest quality of life according to its citizens. One player, one caddie, one AK. AK stands for außer Konkurrenz which means non-competitive. I’m the AK, and if you’re not Sabrina (player) or Gerrit (caddie) let me summarize what you’ve missed: A lot. Let’s start with the course. GC Holthuizen may only have nine holes but they do have two sets of tee boxes for every one of them. This changes your tee shot between slightly (e.g. only varying in length between 3 and 12 or 7 and 16) and profoundly (e.g. changing the angle into the fairway and moving you up an elevated tee box from 5 to 14). It also makes first-time navigation more exciting. The overall layout is varied and simply a lot of fun. 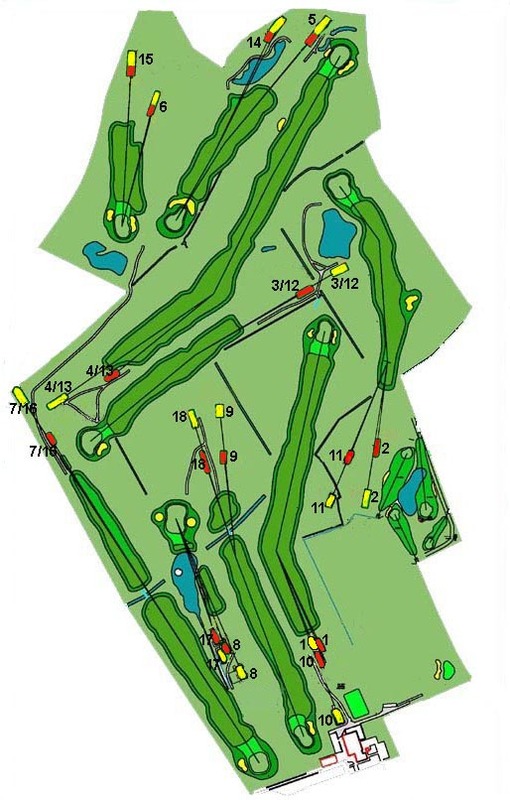 There’s your par 3 over the water (8/17), your long par 5 (4/13), your drivable par 4 (if it wasn’t for that bunker in front of the green, 5/14), your dogleg right (1/10), your dogleg left (2/11), the lot. Before the round I was curious if I would feel disappointed throughout the round not to be spending my day on a proper 18-hole-course. I absolutely wasn’t. Instead, on every hole I was simply thrilled by the thought that I would be able to play this again in less than two hours (spoiler alert: wasn’t really two hours). Playing GC Holthuizen was simply brilliant and I would do it again in a heartbeat. However, I’m sure my take on the course was heavily influenced by the surrounding tourney, the ANWB Golf Pitch Open 2018. It was just pure joy experiencing the wonderful hospitality of the Groninger Albertiaanse Golf Vereniging (G.A.G.V.) Pitch, the group behind all collegiate golf activities in Groningen. They hosted about 40 players on the course and 30 complete newbies at the clinic (what we in Germany would call Schnupperkurs). Here’s how much they cared about the clinic: Pitch organized a shuttle bus to get the students from the city to the golf course and back and made it extra easy to have a go at what we think is simply the best sport in the world. And here’s how much they cared about the tourney: welcome desk, goodie bag, lunch to go, cold beer and beverages at 6/15 (perfect location as you got up there just to see the previous group teeing off on the par 3 and either roar with applause or burst out laughing), awesome (!!!) Schnitzel back in the club house, cool prizes and an excellent location in the city to kick off the night with a beer and another one and another one. Note a local rule though. If you get that night’s golf ball dropped into your glass tradition then requires you to down it immediately. Gerrit (caddie) and Sabrina Oesterwind (Bergische Universität Wuppertal, WUP) are checking out some irons before going with the driver. …and again about three hours later. Later that day: How to hold your glass saying „I’d rather drink this at my own pace“. But now for the proper party piece of the day. This completely unexpected moment that just blasted the whole experience from awesome to going ballistic. In Groningen this was jumping into the Paterswoldsemeer, a huge (270 hectare) lake south of Groningen. You can go sailing there, rowing, hang around on the bank, whatever. But you can also just dive into it and go for a swim. Can you imagine anything better after a round of golf? Well, with the sun out and temperatures well above 30° Celsius we simply couldn’t, so we went. It was the best. Floating about in the water with the sound of all those happy people around you only occasionally muffling away as you submerge entirely (reflex making you ogle the ground for lost Titleists, realizing the absurdity of your behavior making you smile underwater). It made you not only question why you’ve never heard about this wonderful place before, but it made you question if leaving it and going back home was really the best idea available. Why shouldn’t you just stay? Honestly, why not? Thinking about an answer to this question it slowly dawns on you, this is what happiness also feels like. Hitting a solid 6-iron on a par 3 somehow triggers a similar feeling, but still different. It’s really hard to describe it. But trust me, it’s awesome. It’s something you want to experience. That’s why I can only recommend to play this tourney 2019, hope for similar weather and make that weekend a very heavy contender for best getaway of the year. Dirk and team, thank you so incredibly much for giving us the best reason imaginable for coming to Groningen, playing some wonderful golf and having such a mesmerizing weekend. Your tourney was awesome, your hospitality legendary and your statistically documented quality of life incredible to experience.